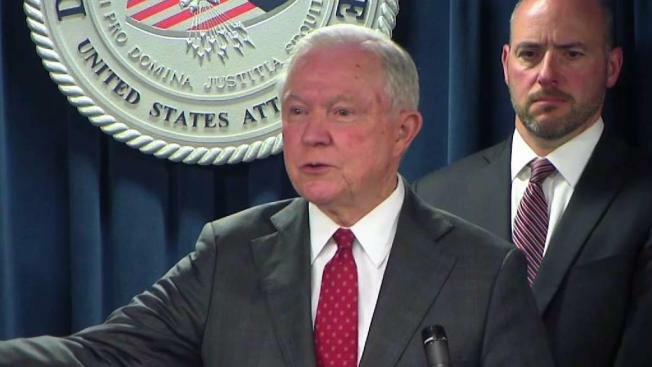 Attorney General Jeff Sessions joined US Attorney Andrew Lelling and homeland security officials at the Moakley Federal courthouse in Boston to announce charges against 28 people, mostly undocumented immigrants, alleged to have stolen identities to get money from the government. U.S. Attorney General Jeff Sessions defended his top deputy Thursday after a handful of congressional Republicans moved this week to impeach him. A group of 11 House conservatives on Wednesday introduced articles of impeachment against Rosenstein, who oversees special counsel Robert Mueller's Russia investigation because Sessions has recused himself. "Personally, my view is that the American republic will not be better if there are marijuana sales on every street corner, but states have a right to set their own laws and will do so," Sessions said.